THE STAND-ALONE PLASMA-ACTIVATION (SPA) TOOL IS A SMALL FOOTPRINT TOOL DESIGNED TO PROVIDE A REACTIVE SURFACE TO BOND SILICON WAFERS AND HETEROGENEOUS SUBSTRATES. The SiGen PA Tool allows room-temperature bonding up to 80% of bulk covalent bond strength. 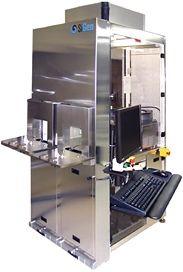 The plasma technology utilizes proprietary dual-frequency RF sources to activate wafer substrates prior to bonding. The stand-alone system allows the integration of SiGen's PA benefits for high yield and throughput substrate production using non-plasma bond equipment. Plasma Activation offers room temperature bonding with a bond strength up to 80% of bulk silicon (i.e., 80% of the force necessary to pull a silicon wafer apart at any lattice plane). A short, relatively low-temperature anneal brings the bond strength to 100% of bulk silicon. The process chamber is a dual frequency parallel plate reactor that consists of top and bottom parallel plate electrodes. The top electrode serves as the "source" electrode with the bottom electrode as the "bias" electrode. Each electrode is connected to an RF generator via an RF match. The top lid swings open on a hinge assembly to allow for wafer introduction into and retrieval from the chamber. At the bottom of the chamber body, there are an exhaust port and inlet for process gas. Mass Flow Controllers (MFC) regulate the gas flow. The electronics components are housed in a separate control rack.